xsliver : I think it's because ATi has generally cared more about optimizing for DirectX, and more recently just optimizing for API. OpenGl was never really big on ATi's list of supported API's... However, adding in Doom3, and the requirement of OGL on non-Windows-based systems, and OGL is at least as important to ATi now as DirectX. How long it will take to convert that priority into performance is unknown. Just a conspiracy theory -- does the NV cards only perform well on the most popular / publicised games whereas the ATI cards excel due to a better written driver / better hardware? Or is the FRAPS testing biasing ATI for some reason? What do you mean "who has the right games"? 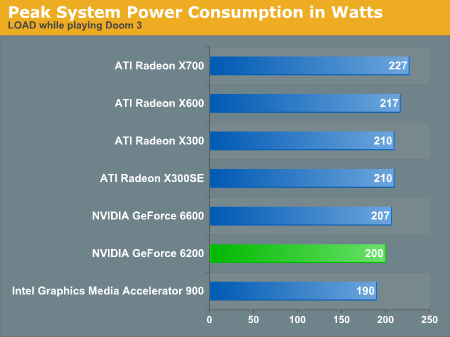 If you want to play Doom3, look at the Doom3 graphs. If you want to play FarCry, look a the FarCry graphs. If you want to play CoH, Madden, or Thunder 04, look at HardOCP's graphs. Every game is going to handle the cards differently. I really dont see anything wrong with AnandTech's current group of testing programs. Furthermore, the games you pick for a review make a large difference for the conclusion. 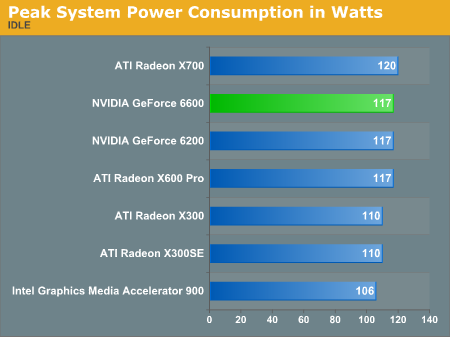 Because of that, HardOCP has the 6200 outperforming the x600 by a small margin. So, I would like to know who has the right games. 1) The X300 was omitted from the Video Stress Test benchmark because CS: Source was released before we could finish testing the X300, no longer giving us access to the beta. We will run the cards on the final version of CS: Source in future reviews. 2) I apologize for the confusing conclusion, that statement was meant to follow the line before it about the X300. I've made the appropriate changes. 3) No prob in regards to the Video Processor, I've literally been asking every week since May about this thing. I will get the full story one way or another. Here's my question, what is better? A Geforce 6800 or a Geforce 6600 GT? I wish there was like a Geforce round-up somewhere. And I saw some benchmarks that showed SLI does indeed work, but these were just used on 3dmark and anyone know if there is any actual tests out yet on SLI? Also to address another issue some of you have brought up, these new line of cards beat the 9800 Pro by a huge amount. But it's not worth the upgrade. Stick with what you have until it no longer works, and right now a 9800 Pro works just fine. Of course if you do need a new graphics card, the 6600 GT seems the way to go. If you can find someone that sells them. Buyxtremegear has the GeForce 6600 from Leadtek for $135. Gameve has 3 different cards (Sparkle, XFX, Leadtek) all under $150 for the 128MB version. they're probably talking about the power consumption under full load.